Magnesium helps maintain relaxed muscle function and a healthy nervous system, helping you to wind down at night. It is also an important mineral for strong bones and teeth. Can also be taken with omega fatty acid supplements to assist their use in the body. 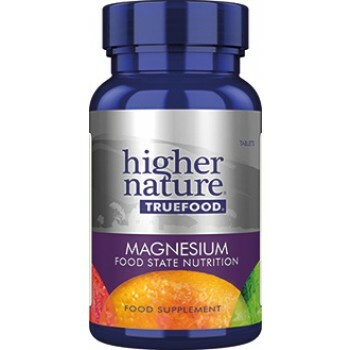 Higher Nature True Food Magnesium contains bio-transformed™ Magnesium, making it easily digested and absorbed. Best taken before bed. A True Food® Supernutrition Plus multivitamin is also recommended. 50mg bio-transformed™ Magnesium, plus other phyto-nutrients, including Beta Glucans, naturally found in the rich food base of a Saccharomyces cerevisiae culture. Higher Nature True Food Magnesium is suitable vegetarian and vegan.